Cynthia Rebholz is a licensed Marriage and Family Therapist and AAMFT Approved Supervisor, offering services to meet your unique needs. Cynthia has a warmth that helps create change. Cynthia is there for you. She understands what it feels like to be uncertain, feel empty, and how couples need to connect, or even discern their relational course. Her interests include assisting folks coping with grief, depression, medical issues and exploring life's purpose. Cynthia’s experiences include working in private practice, Serving as an adjuct professor at the University of Maryland, social services, inpatient adolescent residential treatment, and medical and family service settings, which allow her to work effectively with children, adolescents and adults. She has received several awards, participated in published research and is a member of the American Association of Marriage and Family Therapists. 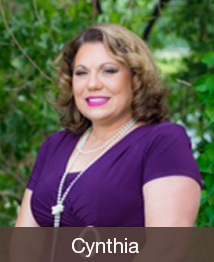 Cynthia holds a Master of Science degree from Nova Southeastern University, a leader in the field of Family Therapy. She also studied research psychology at the University of South Alabama and earned a Bachelor of Arts Degree. Cynthia has also received advanced training in Emotionally Focused Couples Therapy, and Level 3 Gottman Therapy and completed training in Medical Family Therapy. Cynthia is originally from California. Raised in a Latin home, she speaks some Spanish. She now resides in Montgomery County Maryland. Married for 31 plus years to a retired military aviator, Cynthia understands the special demands of military life, moving, deployment and balancing the needs of family, friends and career. Cynthia has three children and a Chihuahua. She enjoys gardening and exploring the outdoors with her family. Infidelity, Marriage Issues, Couple Conflict, Parallel Lives, Intimacy Issues, Anxiety, Depression, PTSD, Panic Attack, Trauma, Stress, Grief Counseling, Medical Health Issues (including caregiver concerns). Senior and Age Related Issues, Parenting, Women's Issues and Cultural Issues.